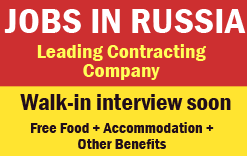 Leading contracting company now hiring for Russia. Russia, the world’s largest nation, borders European and Asian countries as well as the Pacific and Arctic oceans. Its landscape ranges from tundra and forests to subtropical beaches. It’s famous for Moscow's Bolshoi and St. Petersburg's Mariinsky ballet companies. St. Petersburg, founded by Russian leader Peter the Great, has the baroque Winter Palace, now housing part of the State Hermitage Museum’s art collection. Client Interview will be conduct soon.